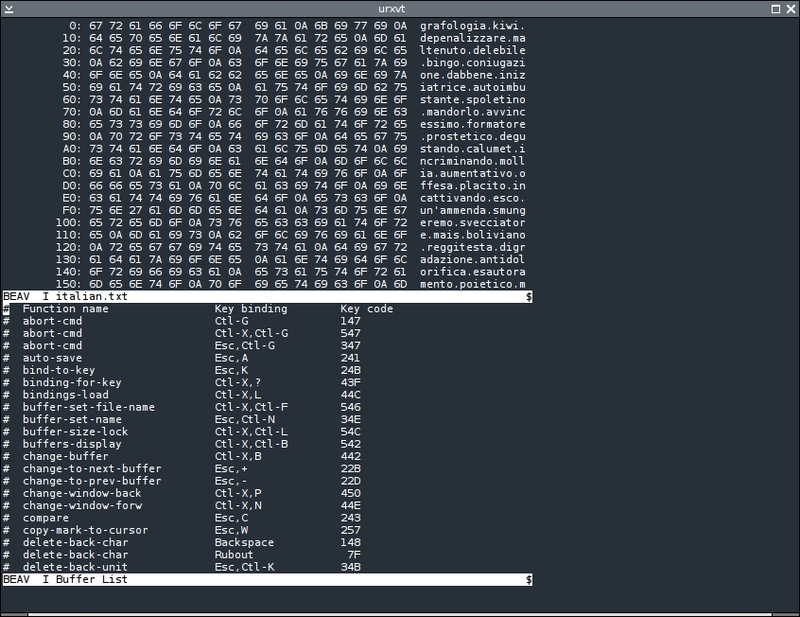 Back to hex editors for a short bit, this time with beav. beav is in both Debian and AUR, but the AUR page points at the Debian package page. Whenever that happens, I think the Debian team is more or less keeping a program alive. That might be the case, since building beav in Arch requires a huge list of patches. And since nobody seems to have a source page available, I’ll have to assume this is it. Correct me if I’m wrong. Regardless, beav is available to both OSes, and quite a few more. As you can see by the help screen, much of what beav accepts as commands appear to be adopted from emacs. Don’t let that color your opinion though. I found working with beav to be a little difficult, mostly because its navigation controls are obscure. Rather than employ the arrow keys, beav uses the CTRL key plus B, F, N and P — back, forward, next and previous, I guess. That’s neither here nor there, but it does mean you not only have to keep the CTRL key pressed to move throughout a file, but you’ll be dancing between those keys — which are not colocated on a traditional QWERTY keyboard — until you get to where you want to go. I don’t think that’s an emacs standard (Jason H says it is), and I find it very cumbersome when compared with one-handed arrow keys, or even just H-J-K-L. I’d hate to be using a micro-keyboard or nonstandard layout with beav. I don’t think I could get much done. Compared with some of the other hex editors I’ve seen so far, I can only give beav fair-to-middlin’ marks. I understand that beav supposedly offers a little more flexibility in editing obscure file types or esoteric data formats, and that could be a plus. This entry was posted in Linux and tagged binary, editor, file, hex on 2014/08/07 by K.Mandla. Those nav keys are the standard keys from Emacs. They also work to navigate the read line in your bash shell, and throughout OS X. I expect Alt-F will go forward by a word, Ctrl-E will go to the end of a line, and Ctrl-D will delete.